On the sign on the previous page, Fort Adams' size is listed as 871,200 square feet. 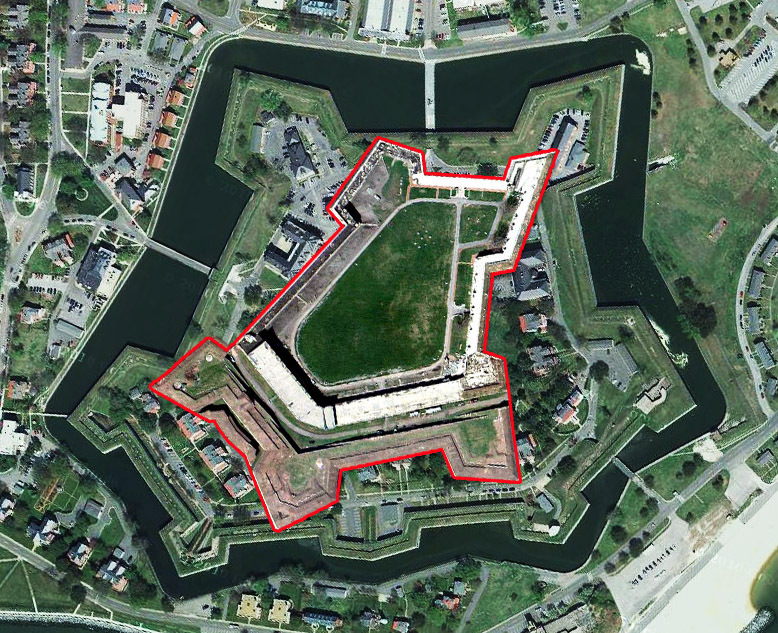 Might I humbly submit that Fort Monroe, in Hampton, Virginia, is 2,744,280 square feet. Please note that Fort Adams would fit snugly inside Fort Monroe. This is not to take anything away from Fort Adams, which is a remarkable, beautiful, historically significant starfort by any measure...but to call it the largest fort in North America is inaccurate. At the beginning of 2018 I received an extremely cordial email from Steve Marino of the Fort Adams Trust, who politely explained that the reason Fort Adams can accurately be called the largest seacoast fortification in North America is because this claim includes the fort's outer works: Throw in the glacis, covered way, tunnels and Southern Redoubt, and Fort Adams is larger in area than Fort Monroe. And this is certainly a valid point! One could easily include all of Fort Monroe's outerworks and keep this good-natured disagreement going, but Fort Monroe's outerworks are mostly Endicott Period batteries dating to 1898 or so, wheras those at Fort Adams were built in the first half of the 19th century to be part of that fort's original defensive works. What Starforts.com will therefore grant Fort Adams is the right to call itself "the largest* coastal fortification in North America," so long as somewhere at the bottom of wherever this claim is made there is the addendum, *in area.